I simply love ranch dressing. Let’s face it, it goes so well with SO may things. Ranch dressing is of course awesome on a fresh salad; as a dip for fresh vegetables; it’s superb with fresh grilled chicken breast, and even perfect for s dip with a slice of pizza. I mean, come on, it’s ranch dressing! Commercial ranch dressings are loaded with sodium. This is unfortunate because when you’re being conscious of your sodium intake, the last thing you need is things like sauces, dressings and dips adding unwanted amounts of sodium. That’s why this recipe for low sodium ranch dressing is perfect. It’s real easy to make and uses just a handful of simple ingredients. 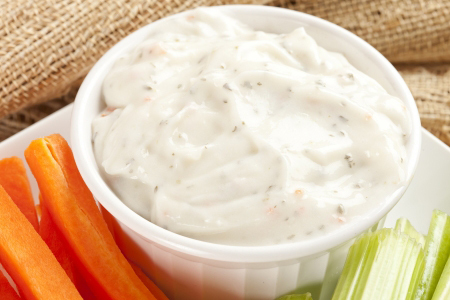 Don’t waste your sodium intake on commercial dressings, make a batch of this delicious low sodium ranch dressing and enjoy it with all your favorite salads, veggies and more! Add all ingredients to a large bowl and mix well until everything is well blended together. Refrigerate in Tupperware containers or Mason jars.